Charmfactory and Mahogany Media were involved in the early concept stages of the campaign – and worked alongside The Hub in creating the final brief for the Live More campaign. 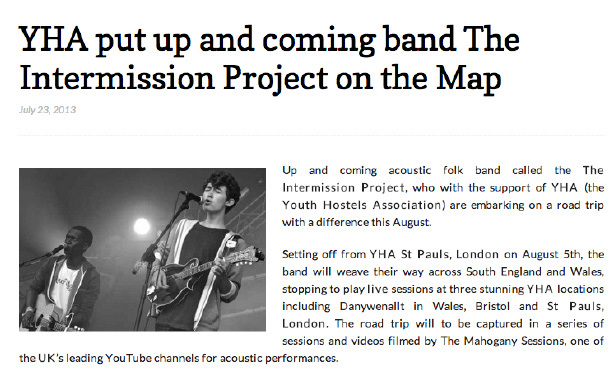 A road trip with an unsigned band ‘The Intermission Project’. We visited 6 YHA hostels around the UK. The band and production crew travelled in a branded YHA camper van. The band played at each hostel. 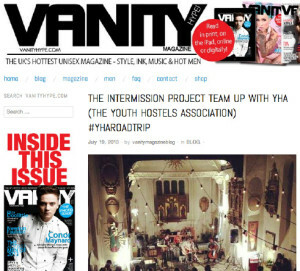 Charmfactory provided the digital PR campaign with a focus on music and youth communities. Mahogany Media provided all production for the Live More Road Trip. Together, a rich content driven campaign was delivered. Mahogany provided a four-part video series, based on an agreed brief, and then delivered it to YouTube with a goal of reaching young, music lovers who could be activated to visit a local YHA to take part in the experiences shown. Here are some of the comments received on the videos, alongside the male/female demographics reached within the platform. 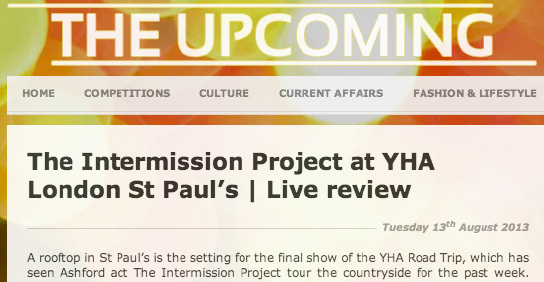 • Generated online coverage about the Live More YHA campaign, anchored to an exclusive track from and the band across a 6 week period with a 3 weeks lead in, 2 week active campaign and a week follow up. Through relevant rich media content, Mahogany provided support through it’s online platforms in the way of imagery and videos. Notably reach was garnered across Facebook and YouTube as follows. Over 1,000 organically generated Likes and 50,000 impressions on Mahogany’s Facebook page. Remit: Our remit was to raise awareness over a short period, of the Live More YHA brand to a younger audience. Using The Intermission Project as our hook into our music contacts we secured coverage within the parameters of the band and the newness of the Live More Brand. The following contacts were unable to attend but have showed great interest in working with us in 2014, including: The Independent, Telegraph, Last FM, Londonist, BBC Radio 1,The Sunday Times, Shout 4 Music, Wise Buddah, 7 Bit Arcade, Hoxton FM, Huffington Post, The London Word, London On The Inside, Clash, Harpers Bazaar, The Line of Best Fit, Amazing Radio, CMU Daily, Sounds of Now, Scientists of Sound. A crucial PR indicator is an assessment of the reaction from our contacts. This campaign connected across the board to a range of media, illustrating good potential for a fully funded/cohesive campaign in 2014. – Music Bloggers: Folk Geek, It’s All Indie, 7 Bit Arcade, Vanity, Music Guide, More Than The Music, The Music Dungeon, Scenewave. – National Press: The Telegraph, The Independent, The Huffington Post; Harpers Bazaar. – Tourism and local press: South Sonic, Bristol Culture, Brecon Beacons Tourism, Hostelling International. – Students: Institute of Contemporary Music, The National Student. 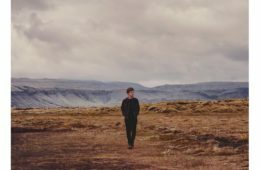 – Radio: Folk Radio UK, Amazing Radio, Hoxton FM, Last FM. We were able to advise on best practice and assist in the launch of the Live More social channels. – Students; young professionals, music lovers and lifestyle. – Facebook demographics reflects a 50% increase in fans as a result of our work in combination with The Hub. YouTube is your strongest channel at the time of writing. 400 subscribers is a great achievement over such a short space of time. Facebook (1,439) and Twitter (382) were very active during the road trip. Overall Reach: Combined total project impressions from Charmfactory and Mahogany are in excess of 4+ million.